In 2003, there was a group called the Grand Rapids People’s Alliance for Justice, which was the main anti-war organizing group in Grand Rapids opposing the US invasion/occupation of Iraq. This group had begun to organize in response to the 2001 US invasion/bombing of Afghanistan and expanded its resistance work to Iraq in 2002, when the Bush administration began threatening Iraq and calling them responsible for 9/11. The Grand Rapids People’s Alliance for Justice had organized teach-ins, created anti-war publications, demonstrations, marches and even civil disobedience at the office of Congressman Vern Ehlers, who represented the 3rd Congressional District. After the action at Congressman Ehlers’ office, the Grand Rapids People’s Alliance for Justice organized a trial and brought charges against Rep. Ehlers for war crimes, including the torture and murder of Iraqi civilians. This creative action was called, The Trial of Vern Ehlers, and was video taped with actors, but was based upon actual data and reports from various human rights organizations monitoring the US war in Iraq. This print depicts that creative action against Congressman Ehlers and was produced by Chelsea Carlson. 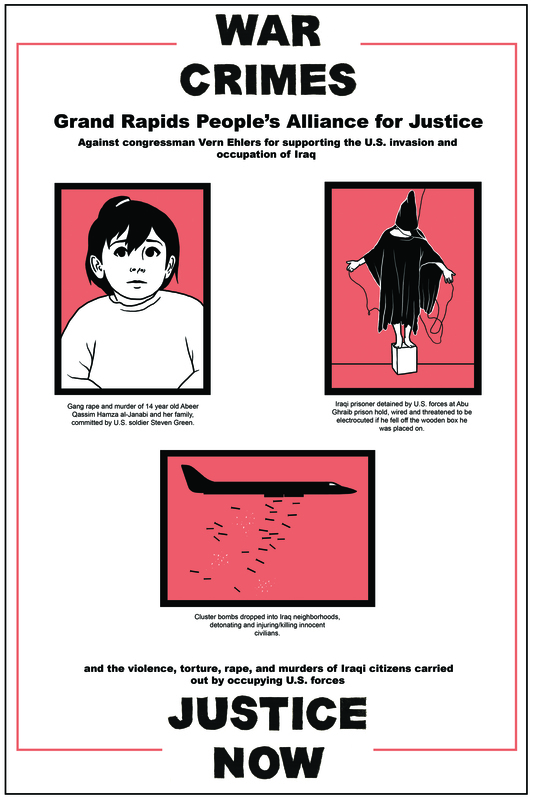 This entry was posted in Anti-War/Anti-Imperialism, People's History Artwork and tagged Grand Rapids Anti-war organizing, Grand Rapids People's Alliance for Justice, opposition to US war in Iraq, The Trial of Vern Ehlers. Bookmark the permalink.